Blueberry season is winding down here in Michigan. I bought 40 pounds this year. I shared a few, froze about 2/3 of them, baked a pie, and ate a lot of them. There is nothing like fresh blueberries in your Cheerios. 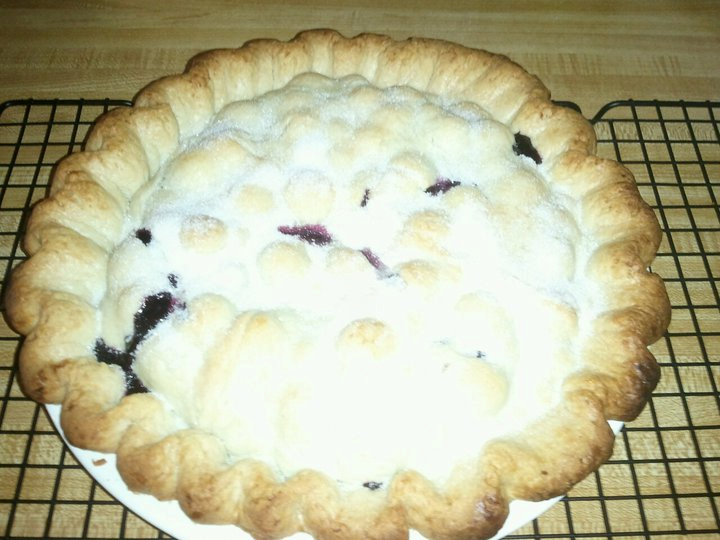 I am more of a cream pie lover, but when blueberry season rolls around I am all for fresh blueberry pie. The recipe I use is from Better Homes and Garden New Cookbook. My cookbook is so well loved that I can't find the copyright page. I received it as a bridal shower gift in 1981. Prepare pastry for 2-crust 9-inch pie. Combine 4 cups fresh blueberries with 3/4 to 1 cup sugar, 3 tablespoons all-purpose flour, 1/2 teaspoon grated lemon peel, 1/2 teaspoon ground cinnamon or nutmeg, and dash salt. Line 9-inch pie plate with pastry. Fill. Sprinkle with 1 teaspoon lemon juice; dot with 1 tablespoon butter. Adjust top crust, cutting slits for escape of steam. Seal. Bake at 400 degrees for 35-40 minutes. Serve warm. Notes: I make my own pie crust, usually. I like a firmer filling so I add 2 teaspoons cornstarch with the flour. I add the cinnamon plus 1/4 teaspoon nutmeg. Source: McRae, Shannon, Images of America Manistee County, Arcadia Publishing, 2006. Last month, I wrote about my excitement in finding my grandmother pictured in the Marquette Images of America book. Would I be so lucky in the Manistee County one? My Manistee County ancestry goes back to the early days of Manistee, Michigan. My Great Grandfather, Johann August Fredrick, immigrated to Manistee in the early 1870's. 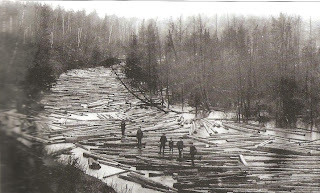 His work centered around the logging and sawmill industry. The first chapter of this book has pictures of that work. Is my great grandfather in it? Not that I know. I only have pictures of him as an older man, so I wouldn't recognize him if he was. In addition to the Fredrick family, I have Graf family who came around 1900 to Brethren, Michigan. 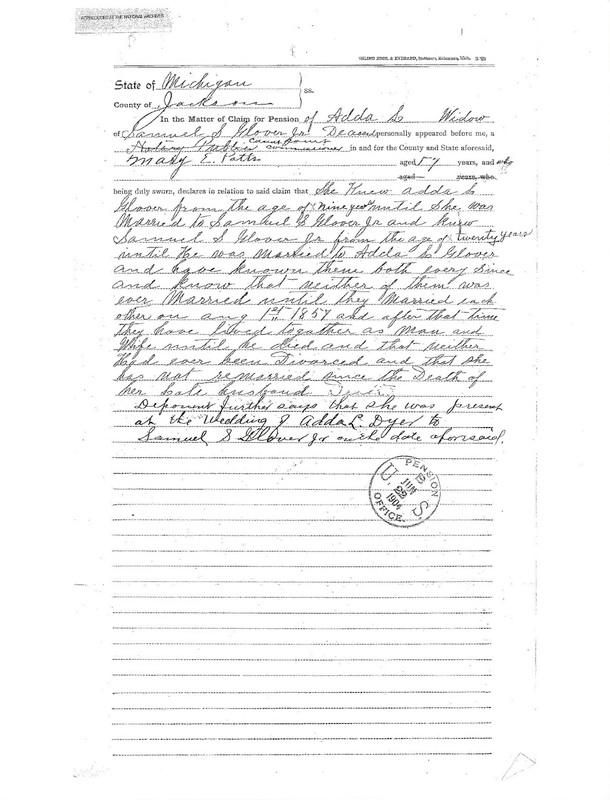 An unconfirmed family story is that Valentine Graf brought his family by wagon train, from Indiana, with a group of German Baptist Brethren members to settle in Brethren. This is something I would like to explore further. One of the pictures in the book is of members of this church before 1901. Is Valentine Graf in this picture? Again I don't know. 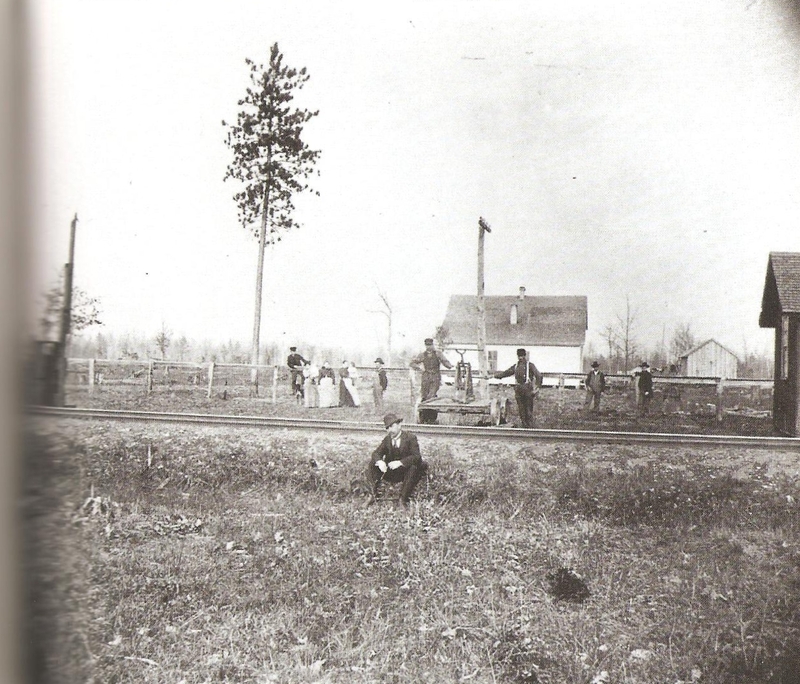 Early picture of Brethren Michigan, which was almost named Lone Pine for the single pine visible in this picture. ﻿Brethren Historical Association maintains a little museum that I have visited. I need to visit again. I would like to learn more about the early days of Brethren and the role the German Baptist Brethren played. The Manistee County Images of America book has given me new avenues to explore. 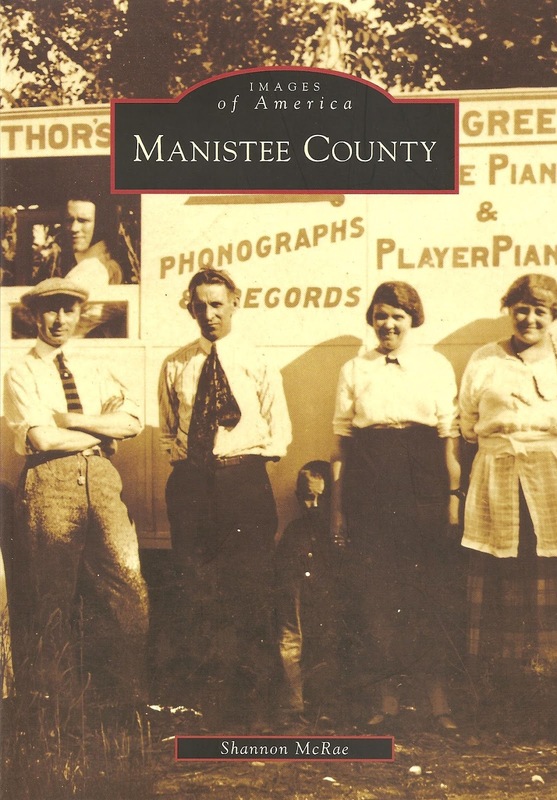 Their pictures are a wonderful, historical representation of the early days of Manistee County. A time when my mother's grandparents settled there. I have so much more to explore now thanks to this book. How many times as genealogists do we find surprising things about our ancestors while researching? I found one such surprise in the Muskegon Chronicle, Muskegon, Michigan newspapers. My 2x great grandmother, Adda L. (Dyer) Glover, aka Mrs. S. S. Glover, was a member of the Women's Christian Temperance Union (W.C.T.U) in Muskegon, Michigan. According to the W.C.T.U. website it was "organized by women who were concerned about the destructive power of alcohol and the problems it was causing their families and society." Members chose to abstain from drinking all alcohol. The W.C.T.U. was founded in 1873 and organized nationally in 1874. They met in churches for prayer and marched to local saloons to ask the owners to close their establishment. The first mention I found of Adda's membership was on page 3; column 2 of the April 11, 1881 edition of the Muskegon Chronicle. It stated, "Mrs. S.S. Glover and Rev. M.W. Fairfield will address the temperance meeting at the opera house, Sunday, April 17th. 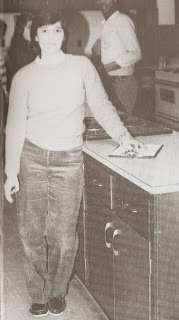 The next article found showed that not only was Adda L. Glover a member of the W.C.T.U., she was an officer. 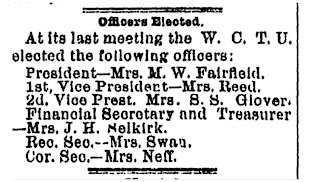 This article dated June 30, 1881, page 4; column 3 reported: "Officers Elected-At its last meeting the W.C.T.U. 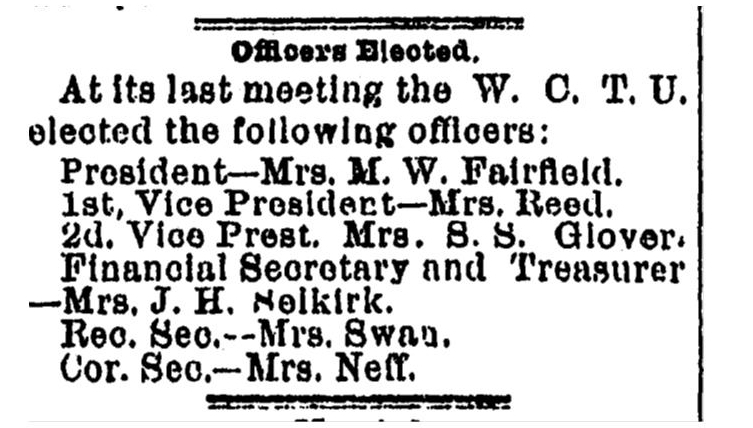 elected the following officers: President-Mrs. M.W. Fairfield 1st, Vice President-Mrs. Reed, 2d Vice Prest-Mrs. S.S. Glover, Financial Secretary and Treasurer-Mrs. J.H. Selkirk, Rec. 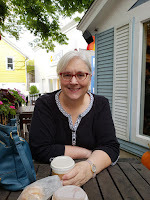 Sec-Mrs. Swan, Cor. Sec.-Mrs. Neff." 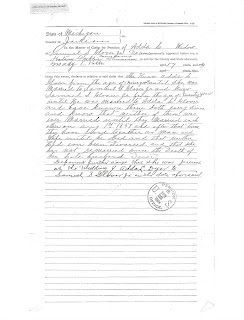 Another article from the August 24 1882 Muskegon Chronicle, found on page 2; column 3 in the Personal Pointers section, states that, "Mrs. S.S. Glover, Mrs. J.H. Selkirk, and Mrs. Eldred, left this morning to attend the W.C.T.U. convention at Whitehall." These articles show that my second great grandmother, Adda L. Dyer Glover was an active member of the Temperance Union. Were these the only articles I found? No! I found one about a July 4th incident. I will be sharing more in future posts. Labels: Adaline L. Dyer, Muskegon, W.C.T.U. The first time I heard the word Posen was when I asked my mother where her grandfather, Johann August Fredrick, came from. She said the only thing she knew was Posen, Prussia. Well, it is a start and better than just Prussia. Was Posen the town he came from as a few of my cousins believed or was it the Province? If it was the Province, then I had my work cut out for me. It wasn't until I was contacted by a 'cousin', Michael, who lives in Germany and is a Fredrick, (or Fredrich as it was known in Prussia) that I knew for certain. It was the province. 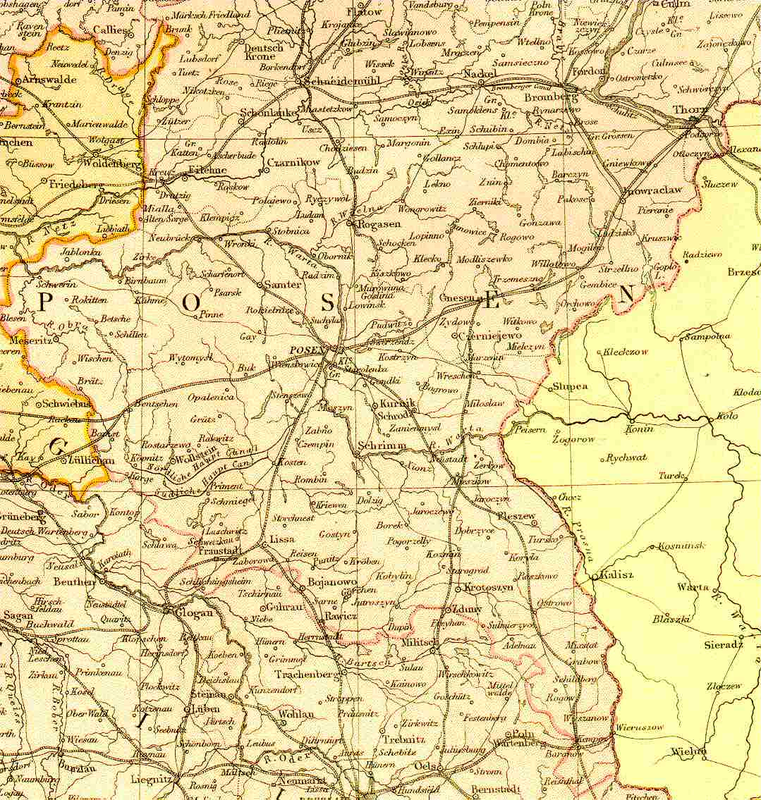 More specifically, the Bromberg area of Posen. Once that was discovered I went looking for information. One of the websites that I have found helpful with my Posen the Province research is Posen-Official website of the Posen-L mailing list. It is so much more than a mailing list. 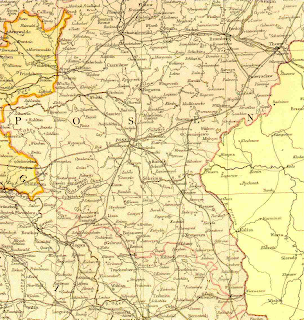 It has information from the Prussian Province of Posen, which is also known as Posen, Germany; Posen, Prussia; Province of Posen; Poznan, Poland and a few other names. Subscribe-where you can subscribe to the mailing list. I have barely touched the surface of this website. 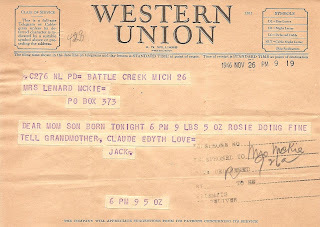 Every time I go to it I get wrapped up in the information there. I even got sidetracked when I went to capture the url for this blog post. Do you have Posen, Prussia ancestry? Give this website a look, you won't be disappointed. Source: Glover, Hattie L. "Fenn", family data. In The Holy Bible: with Revised New Testament. Chicago: GW Borland & Co., 1882. Original owned in June 2010 by Brenda Leyndyke, [address for private use], Battle Creek, Michigan. 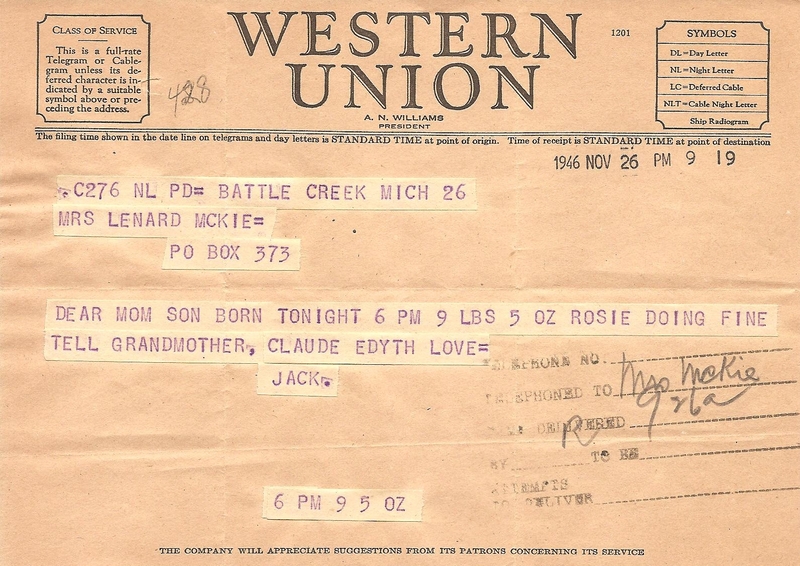 "DEAR MOM SON BORN TONIGHT 6 PM 9 LBS 5 OZ ROSIE DOING FINE TELL GRANDMOTHER, CLAUDE EDYTH LOVE=JACK"
Mrs. Leonard McKie-Adeline E. Glover Tyson McKie, the daughter of Frank H. and Hattie (Fenn) Glover. Son Born-Jack G. Tyson, son of John 'Jack' Glover Tyson and Rosalene M. (Richardson) Tyson. Grandmother-Hattie (Fenn) Glover of Hattie's Bible fame.